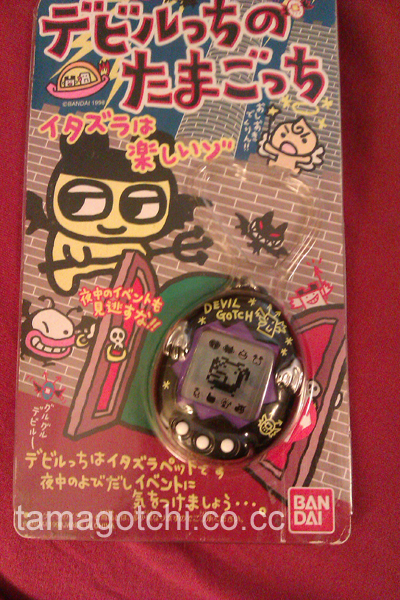 The Devilgotchi is a Japanese version Tamagotchi that came out in the late 90's. 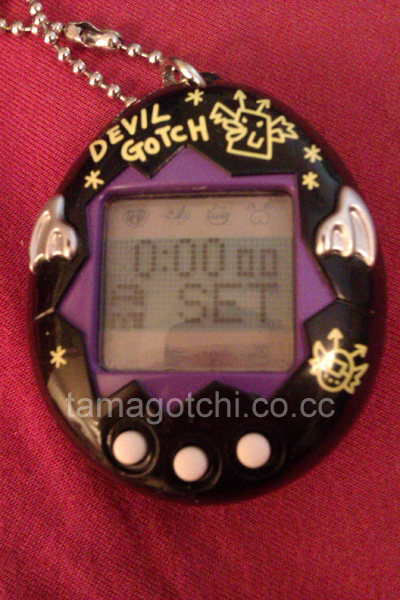 It is considered to be one of the rarest Tamagotchis of all time, and normally sells for hundreds of dollars on eBay. I did not pay hundreds because I am a good bargain hunter, but I can tell you that finding one in good condition for under $100 is a major feat (which I happened to accomplish :P). So far I have not played with this Tamagotchi extensively, but here are a few of my observations. The sounds on this Tamagotchi are some of the most annoying that I have ever heard from a virtual pet, BUT to its credit, it is a fairly quiet virtual pet. I think the reason the sounds are so grating to the ears is because well... its a Devilgotchi. Its not supposed to be pleasant XD Its basically supposed to be the opposite of an Angelgotchi, if you hadn't gathered already. It has devil characters, or little demons, whatever you want to call them. I have to say that after looking at the growth chart most of the characters are not especially cute, but it definitely makes for a good masculine virtual pet. Too many times I have heard the question "Aren't Tamagotchis are girl toy??". No, they are not by definition a "girl toy", but they do come in masculine and feminine designs and themes. Tamagotchis are a unisex toy, meaning they weren't originally geared toward a particularl group of people. They are simply a digital game that was meant to appeal to both boys and girls. The Devilgotchi, however, definitely has some masculine appeal, but in a cute way. The design I got is black with purple trim and silver wings. Ideally I would have liked to have collected the pink version, but obviously you can't be picky because these things are so rare and frankly I'd rather buy the black one for under $100 than the pink one for over $100. Overall, it seems as if the functions of this Tamagotchi are not particularly different from any other Tamagotchi I've played with. 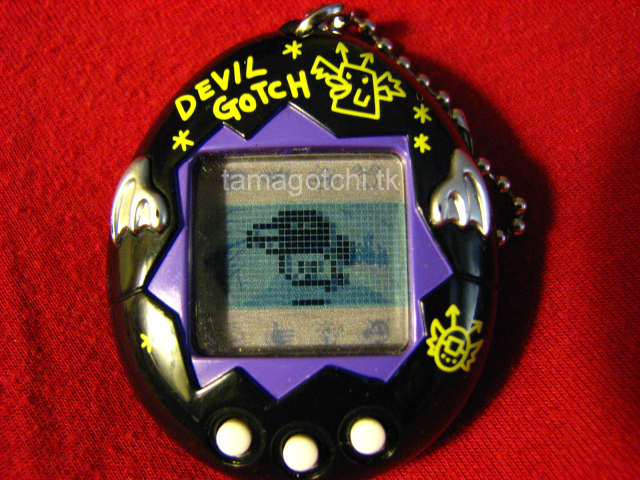 I'd say that the Santagotchi has the most unique features out of all the vintage pets, so the Devilgotchi stays within the lines when it comes to feeding, playing with and raising a pet. The buttons are easy to push and the functions are very responsive. 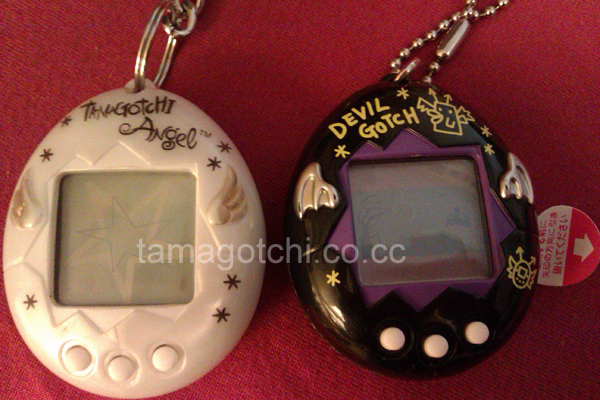 If you remember the lag of the Angelgotchi, you'll notice that the Devil is much faster. After having recently played with the Devilgotchi all the way through to adulthood I would like to give this Tamagotchi an 8 out of 10. The buttons are soft and easy to push, the shell designs are cute, the gameplay is super easy. My old gripes are that the sounds are annoying and it takes forever to get this virtual pet to adulthood!